Pointing out to the difficult geographical conditions of Uttarakhand, Chief Minister Ramesh Pokhriyal Nishank urged the visiting Central Relief Fund members to give relaxation to the calamity-battered state and increase the relief amount. Uttarakhand Chief Minister Ramesh Pokhriyal Nishank at a meeting with the Central assessment team in Dehradun on Saturday. The Central team visited disaster-affected areas in Dehradun district. After the inspection, all three teams landed at Sahastradhara helipad where they were welcomed by the Dehradun District Magistrate (DM) Sachin Kurve and Archana Gaharwar Additional DM (E). The recent heavy rainfall has not only affected shops, houses and offices in the capital, but has also damaged many school buildings. The prime victims of the recent disaster that struck Kumaon in the form of cloudbursts, flash floods and landslides are farmers and those residing in rural areas of the region. Crops bear the brunt of the flowing water at Pinrau village in Almora district. On the occasion of golden jubilee, Carman School conducted a fête ‘Fun-n-Fair’ on the Ranger’s College ground here today. Students at a stall at the ‘Fun-n-Fair’ fête at Carman School in Dehradun on Saturday. Sanskar International School, Dehradun, celebrated its founder’s day on the premises of the school campus here today. The chief guest of the programme was Alok Behari Lal DGP (Rules and Manuals), Uttarakhand. It is not every day that city residents wake up with the news of a film shooting going around. As people started getting ready for work, the news spread around in a few minutes that a film crew from Yash Raj banner had made the city their home for the next few days. Within minutes crazy fans started gathering at the venue to have a glimpse of their beloved stars, Imran Khan and Katrina Kaif. To commemorate the 78th Raising Day of the Indian Military Academy (IMA), a function was organised to facilitate the civilian staff. A total number of 32 civilian employees were selected for the award. These awards are given to the individuals who have done exemplary work in their field and motivated others. Kuhoo and Akshita beat Himani and Deepti 21-7, 21-11 to win the under-13 girls doubles title at the 10th State Sub-junior Badminton Championship here today. St Joseph Academy and Col Brown School set up a final clash in the Inter Council School Sub Junior Boys Football Tournament under way at Guru Nanak Academy. The final will be played at 4 pm on Monday. The Willis Club won the Brijender Singh Pundir Memorial Football Tournament beating Uttarakhand Tigers 5-4 in the tie breaker here today. The Stadium team beat Rishikesh 30-13 in the boys category during a league match of the District Handball Championship here today at the Parade Ground. At a meeting today with Planning Commission and Finance Commission members, the Chief Minister asked for additional funds to carry out repair work of roads. While sharing the details of the damage that the state had suffered with the team, Dr Nishank said the state required Rs 21,200.79 crore for rebuilding damaged infrastructure of different departments, including tourism, irrigation, power, PWD, education, Jal Sansthan and Transport Department. In addition, residents of over 200 villages had to be rehabilitated, he said. The Chief Minister said considering the damage, the amount of the Central Relief Fund was inadequate. “Despite its limited resources, the state managed to launch a relief operation on a war footing that managed to reduce casualties. The government took the assistance of the NDRF, Army and police and six helicopters were used in the relief operation,” the Chief Minister said. He apprised the team about the urgency to shift 233 villages to safe places for which Central assistance was immediately required. “At any cost, we have to rebuild the villages to stop the migration of youth,” said Dr Nishank. 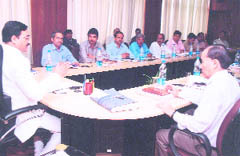 Members of the Central team also met Chief Secretary Subash Kumar and other senior officers. The Central team leader Joint Secretary (Home Ministry) GVV Sarma assured the state that Central assistance would be given on the basis of requirement. The Central team visited disaster-affected areas in Dehradun district. After the inspection, all three teams landed at Sahastradhara helipad where they were welcomed by the Dehradun District Magistrate (DM) Sachin Kurve and Archana Gaharwar Additional DM (E). Thereafter, the DM took the members to Doiwala via road to show them the damage to fields. The team also inspected the pucca houses of villagers, electricity poles and water pipes that were destroyed by the incessant rain. The team also examined the road that was damaged due to flooding of the Susva river. They also visited Mohammadpur Barkali, Khatta Pani and Daudawala areas. The DM apprised the team that the district had suffered damage worth Rs 725 crore. He said that along with 163 roads, 43 bridges as well as 32,000 hectare of agriculture land was also damaged. The DM said that crops also suffered heavy damage due to landslides. The school building of Government Girls Inter College that is located in the hustle-bustle area of the Rajpur Road got damaged due to incessant downpour. The dilapidated school building now appears to be an abandoned haunted villa with creeping roots of banyan tree through fissures in ceilings and fungus on the walls. School Principal Mohini Thapliyal said, “The building was damaged due to the incessant rain this season. As soon as the school administration learnt about the damage, the affected rooms were vacated. We have reported of damaged, along with the estimated budget required for renovation to the Education Department, Dehradun, but no funds have been given by the department so far”. Earlier in this month, the leakage in the building resulted in incidents of electric shocks in the computer laboratory due to the seepage of water into electrical items, which still prevails. All electrical gadgets and systems in the laboratory have got dampened due to which both rooms are locked till the renovation begins. “Though more than a week has passed, the dilapidated conditions of the school building still prevail. Due to the financial crisis and lack of funds from the Education Department, we are helpless to begin with the renovation of the building. Two of the most damaged rooms of the school building i.e. computer laboratory and the music room have been vacated for now. The incident of electrical shock at the computer laboratory could have been fatal, but, luckily, nobody was injured,” Thapliyal asserted. As per the information from the department, in Dehradun district, 154 schools have been listed as ones which require immediate renovation and repair. Some portions of the buildings are seeping, embankments have collapsed, while water has entered the premises of many schools in the town. The department has written to the state administration demanding funds for its restoration. District Education Officer Geeta Nautiyal expressed concern over the damage of school infrastructure. “A clear picture of accurate account of damages has come now after the rainy season got over. The department has begun with the work of relief and promised regular opening several such damaged educational institutions of regular operating soon while a fund of Rs 33 crore has already been released by the department”. “We have asked the school authorities to submit their reports to block education officers regarding the damages, along with the estimated budget required for relief work. The estimation will be further passed on to the State Project Office, District Planning Office and the Disaster Management Department,” added Geeta. The region is known for its varied agriculture produce. While in the Terai region it has been the loss of paddy at large, along with other pulses and cereals, in the hilly terrain it has been the cash crop of vegetables that has been devastated. Two blocks of Okhalkanda and Betalghat of Nainital district, along with the worst-affected stretch between Khairna and Kwarab in Almora district are the prime vegetable producing areas of the region. The produce from this region goes as far as the national Capital. But today what stands in place of vegetable fields are patches of barren land as everything has been washed away by the rivers in spate. People of the Betalghat region pointed out to The Tribune the patches where the entire crop laid devastated. “With the good rainfall recorded in August, we had expected rich returns from our fields. But all that we have got is sheer misery,” said Duni Chand, as he sat along what remained of his vegetable field. The problems with farming in the mountainous zone are unique in several ways. To begin with the region continues to grapple with the issue of fragmentation of holdings. Irrigation again is a problem in highlands and at several places it is the rain-fed agriculture that exists. The fields of the farmers are not very large in size, unlike in the plains. To cap it all, these farmers will not get much respite even if they are given relief as per the existing norms of compensation. Old timers point out that in the early 1990s the farmers facing drought had got relief of amounts like Rs 500. “Just availing the Rs 500 through cheques from banks located in towns cost him much more,” a senior official said. The problem in the Terai region, where agriculture is quite different from the hilly terrain and is on the pattern that exists in the plains, has been compounded by the fact that large tracts of agricultural land has simply been washed away by the rivers and streams. This phenomenon has been largely recorded in parts of Udham Singh Nagar district in the areas of Sitarganj, Khatima, Tanakpur, etc, along with Gaula Par and the Ramnagar areas of Nainital. Chief Development Officer (CDO) of Nainital Deepak Rawat said, “About 5,500 hectare of crop land has been devastated in the district”. He says that the losses are still being tabulated, as several villages are still inaccessible. Gram Pradhan of Pinrau village in the Chhota Kailas area Umesh Paledia said, “There is nothing left of the vegetable crop in our area which is otherwise known for its vegetable and chilly produce. The Kailasha river has destroyed everything”. 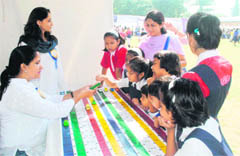 The fair was organised for the students, parents and members of the Old Students Society. Chief guest of the programme was Francis Moore, former MLA, Uttar Pradesh government. The fair began with its inauguration by the chief guest followed by a welcome speech of Principal GIG Mann. A large number of present and former students had gathered to participate in the fete. Different games and other activities, such as hoopla, rat race, slow-cycle race and fishing the bottle were conducted and thoroughly enjoyed by the Carmanites. 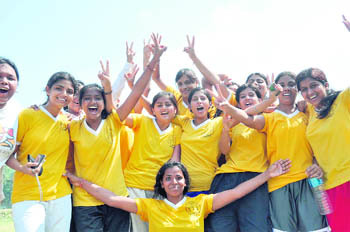 The chief guest also awarded the winners of the games. Apart from the games and quizzes, all guests relished South Indian, Punjabi, Chinese cuisines and snacks that were served at different stalls. A horse chariot was another attraction for small children which gave them luxuriant rides. Present at the fair were Principal Mann, BSP MLAs Virender Singh and Ashok Rana, DS Rawat, SS Rawat and others. On the occasion of the 50th year, the school also announced a picnic tomorrow at a farmhouse near Vikas Nagar. The programme began with the lighting of the ceremonial lamp, followed by the Saraswati Vandana sung by the student choir. Students also presented a colourful cultural programme representing different states of India. The children of playgroup, nursery and KG presented foot-tapping dance numbers. The school choir also presented the Vaishnav Bhajan on the occasion of Gandhi Jayanti and a short speech on his life as well as work. Students also enacted an English play, “The Bet”, Hindi play “Jamun Ka Ped” (a satire on government office working) and folk dances of Kashmir and Rajasthan, but a western dance by senior students won the appreciation and applause of the audience the most. Also present at the event were Dr RN Saral, Deputy Director, Baba Farid Institute of Technology, Col PD Kuriyal (retd), vice-chairman, Sainik Kalyan Parishad, and Suchit Narang, classical vocalist as guests of honor. To culminate with the programme, the Principal of the school delivered a vote of thanks followed by the National Anthem. It is not every day that city residents wake up with the news of a film shooting going around. As people started getting ready for work, the news spread around in a few minutes that a film crew from Yash Raj banner had made the city their home for the next few days. Within minutes crazy fans started gathering at the venue to have a glimpse of their beloved stars, Imran Khan and Katrina Kaif. Imran, who became hot favourite among girls after the success of “Jane Tu Ya Jane Na”, didn’t disappoint his fans. Though it was difficult to reach him, he smiled and waved to his fans from his open car. Wearing dark blue tees, Imran was looking very handsome and it could be heard people screaming, “I love you Imran, you are so cute” etc etc. In the morning when the crew gathered to shoot, photographers also reached there and had a little fight as they were denied entry near the location. Later a representative from the team came out and apologised, but still no one was allowed to get near them. People got disappointed when they were not able to see Katrina Kaif who was also expected to visit today. Sources confirmed that she would directly be visiting Mussoorie tomorrow. The shooting kicked off in the morning with a scene of Imran reaching the station and being welcomed by his friends. Later, the crew travelled to the Rainwala station and returned to the Dehradun station in the afternoon. The film is directed by Ali Abbas and was packed up for the day at around 5 pm. It will be shot around the beautiful locales of Dehradun and Mussoorie for the next four days. Officiating Commandant, IMA, Brig Pravin Joshi in his speech said, “We all must continue to work with the same zeal and enthusiasm to achieve the organisational goal”. He also lay emphasis on security related issues in the present environment to all ranks. In the end, he complimented all award winners and wished the employees and their families well. An appreciation certificate was given to each award winner, along with a yellow label batch, which they put on their uniform. This will give the individual pride in his work and inspire others to do the well in their work/profession. The event was followed by group photographs and tea all civilian staff, officers and all ranks of the IMA. Winners of the 10th State Sub-junior Badminton Championship pose with their prizes in Dehradun on Saturday. Nainital girl Kuhoo also posted a win in the u-13 girls singles final defeating her doubles mate Akshita of Almora 21-17, 21-15. Almora’s Bodhit and Lakshya paired together to beat Chirag and Ujjawal of same district 17-21, 21-13, 22-20 in u-13 boys doubles final. Bodhit of Almora got the better of Lakshya of same district 21-12, 21-17 in u-13 boys singles final. In u-16 girls singles final, Almora’s Smriti beat Kuhoo of Nainital 22-24, 21-18, 21-9. In the first semifinal, Col Brown beat Guru Nanak Academy 1-0. Harkaran Singh scored the winner. St Joseph Academy defeated MIS 5-2 in the second semifinal to register the final berth. Archit Uniyal (5th), Tenzing (27th, 28th, 41th) and Ishan Negi (46th) scored for the winning team. Aditya Kulhan (22nd) and Dechan (42nd) netted a goal each for St Joseph Academy. The match was held at SGRR Degree College, Pathribagh. As the match remained goalless in regulation time, the winner was decided by a penalty shootout. Shyam Thapa, Rajesh Gurung, Anurag, Satish and Ravi scored in the tiebreaker for the winning team. Abhiruchi, Rahul, Rajender and Balvinder scored for Uttarakhand Tigers. A match in the District Handball Championship under way at Parade Ground, Dehradun, on Saturday. In the girls section, the SDS team beat ABC Club 4-1.